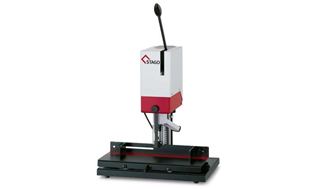 STAGO Paper Drilling Machines are ideal to be arranged for your personal range of use. The PB 1000 series machines are suitable for punching larger paper stacks in offices, law firms, schools, government agencies, copy shops, and small print shops. The ergonomic, simple, and robust design enables them to have a wide range of applications. Stacks of paper of up to 60 mm can be punched in a user-friendly way and without much effort. Interested in the Stago PB1006?